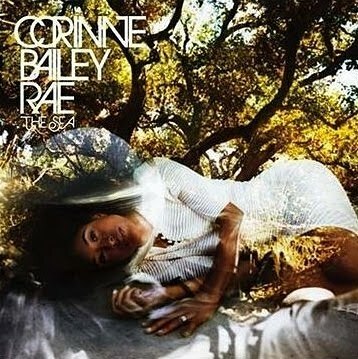 “This album, like everything I do, is made to try and impress Jason Bruce Rae.” Such is what British songstress Corinne Bailey Rae pens in dedication to her late husband in the liner notes of her current work, The Sea, underscoring how much its songs are shaped by circumstances that made her a widow before she turned thirty. As she first exhibited on her eponymous debut in 2006, Bailey Rae naturally betrays a certain amount of pathos and fragility in her voice. On The Sea, she now resonates with those qualities all the more. Still throughout, she does so with serenity and resilience, never coming across as dour or self-pitying. To the contrary, she is enchanting and at times zestful, personifying the latter especially well on “Paris Nights/New York Mornings” and “Paper Dolls,” both cuts benefiting from rich, irresistible grooves. The same can be said (and then some) for “Feels Like The First Time,” during which she echoes Marvin Gaye’s spiraling, layered arrangements on I Want You, rivaling its musical sophistication while asserting her own sensuous semblance of soul. Alas, she is at her most resonant when she slows the music down as if retreating to her innermost reflections, summoning moments of breathtaking poignancy from the grief of her experience. “So young for death/We walk in shoes too big,” she sings on “I Would Like To Call it Beauty,” almost trembling in a whisper above a subtle, acoustic guitar. It takes no small amount of courage to confront such mournful, mortal concerns—some people never come to terms at all with the loss they’ve endured in their lives—and by no means does Corinne Bailey Rae come across as if she's overcome her own. Yet in expressing her sorrow with such honesty and grace, she’s rendered an exquisite album that ultimately transcends its subtext to inspire solace. Nice review, Donald. I too found the album both uplifting and mournful, and overall beautifully written and performed. Thank you very much, Kit. I enjoyed your review on this as well. And I certainly agree with your assessment here. It's one of the most poignant and musically intriguing albums I've heard in the past few years.